Y've probably talked a lot about the subject in previous threads. But I ask anyway. Do you know whether it is possible or know of someone who has done it. Started from scratch on the fiddle and managed to be semi or full pro Fiddler when a person started as 40 or 50 years, with the Fiddle, I think playing in the 1-3 position. If you dont know anyone do you believe that it is possible or not ?? Anything is possible, but as they say, "Don't quit your day job until it happens." The difference between an amatuer and Pro isnt skill, its being paid. If most of your income comes from playing (regardless what that amount is) youre a Pro. I used to own a boat and made money in Bass Fishing tournaments on weekends, but I had a fulltime job in construction then during the week. When I used my own boat I was labeled Semi Pro, from the back of anothers boat, amatuer. For a short period of my life, I ran a poker forum and collected ALL my income from playing poker, I was a Professional poker player. See what Im saying here ? If by pro / semi-pro you mean getting paid to play, and not necessarily getting paid enough to make a living then I think it also depends on the genre. There are probably millions of guitar players, bass players, drummers etc who get paid to play in various sorts of bands. I would guess that if you want to get into pop, folk, country, blues, rock, celtic, or the like then with hard focused work I would think it would be quite possible to work up to the level that you could get paid to play. However, if you are talking about classical orchestral performances then it would probably be much more difficult. Yes it is possible. You can learn three times what a five year old can learn per year if you have the time. You are not limited by age you are only limited by others. Ignore those who say it is not possible. Said a girl who's dying wish was to play the violin. Can a person take up an instrument at 40 or 50 and become a professional musician? Sure. As others have already mentioned, professional means you can make money or a living at it. It is not a measure of skill or ability. If you live in the US, I think the IRS considers you a professional if you earn over 600$ in a year (gross, not net) doing something. Below that, it can still be considered a hobby when you file your taxes. Not saying you don't have to be good at it to be a professional. But being a professional musician is about getting gigs and doing paid performance. Being good is no guarantee of that. I have known some people over the years who were excellent players, and never got much further than the walls of their own room. To be a professional in any field, you need networking, promotion, you need to learn to recognize opportunities, etc. That is the business side of things, and you either need to learn how to do that or find people who can do it for you, if you want to be a professional. There's people all the time taking a career change, where they go back to school and learn a new skill set. There's folks of all ages who learn how to succeed in their own business. 40's and 50s "isn't as old as it used to be", anyway. Years ago, in their 50s, a lot of folks were thinking of retirement. These days it is more encouraged to keep working longer and to consider a change in career direction instead. If you meant something like being a top soloist in a major symphony, though.. Uhh.. I don't know. Not my world. I'm acquainted with a guy who was a drummer for a long time, then decided to take up guitar, teaching himself. He practiced a lot for several years, starting at age 40 or so. Now he has a band and also does solo gigs. He's busy all the time, but I don't get the impression that he makes a lot of money at it. Besides his gigging, he has a music-related business. So I think you could call him semi-pro. I remarked to him that I was surprised he could do well after kind of a short time learning. He said something like "Yeah, it's kind of scary", meaning that he couldn't believe he was getting away with it. So he seems to be getting along well enough. I think that when a person tries something like that, it should be something that they love. 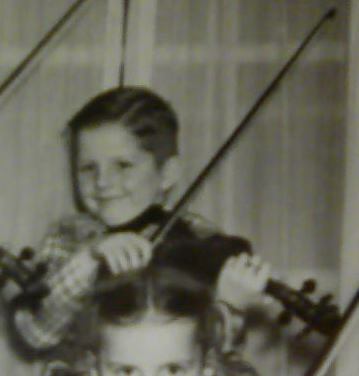 I first started playing violin at the age of four. When I was six my mother was working at a "Howard Johnson's" restaurant. One evening she took me there, (violin in hand) and let me play for the kitchen help and waitress's. When I finished playing I received one of "HoJo's" famous 28 flavors ice cream cone. Did that cone (probably valued at $.20 at the time) make me a pro. ? I'm acquainted with a guy who was a drummer for a long time, then decided to take up guitar, teaching himself. He practiced a lot for several years, starting at age 40 or so. Now he has a band and also does solo gigs. If by pro / semi-pro you mean getting paid to play, and not necessarily getting paid enough to make a living then I think it also depends on the genre. I first want to say I am very happy to learn to play the fiddle. Money iscreame and other stuff is good if you can get that for playing LOL. "if you have the time" ... hmmm, that sounds like it's somehow related to "You are not limited by age". you are only limited by others. Then if I'm not progressing, it's someone else's fault? Now I just need to figure out specifically whom to blame? The meaning seems clear, but maybe I'm not understanding. you are only limited by others. Ignore those who say it is not possible. I think what Toni means here is that, if people keep telling you that you can't do something, that in time it begins to work on your belief that you can't do it. "Oh I can't learn to drive a car, Dad said I'm not good at things like that"
Yes, the statement "you are only limited by others" was vague and incomplete. Sorry that has provided confusion to you. I hope to clear it up now. I meant that some people let themselves be limited by what others tell them. Not particularly in this group. Mostly here in this group, I think we ignore what we are told about adult beginners and the stereotype that we wont be "anything" or "go anywhere" with our music. Some here are more realistic and like to state the impossibilities of what others can and can not achieve. That is fair enough, but I don't particularly listen when someone tells me the "reality of what I can achieve." And well, as a few have stated, we shouldn't quit our day job... and that is sound advice. Sorry for the confusion on my post. I type on my phone sometimes and I am overly vague and incomplete in my thoughts. I certainly do not believe " if you are not progressing it is someone else's fault. " We ONLY have ourselves to blame if we are not progressing, as you well know. I wouldn't go all the way in that direction either. The things we do and the things we can do depend both on us and on the world we are in. Our problem is along the lines of finding out what we want to do, what we should do, whether those will make us happy, and whether those are possible. Problems come when our thoughts and emotions aren't enough to guide us well. Sounds a lot like negotiating with terrists. Do you mean, "terrorists", and if so, I'm lost on that statement. Yes, Ken, that's what I mean. Well, if the terrists or other kidnap somebody, there's a choice of paying the ransom or not. If you pay, they have an incentive to do it again. If you don't pay, they don't gain as much. So paying someone not to play would likely become an ongoing thing.